#1 −Do DiSC styles change over time? Each DiSC style is influenced by a variety of factors such as life experiences, education, and maturity. Therefore, as you gain skills and knowledge, the results of your Everything DiSC Workplace assessment may change as well. It’s not likely you will see anything significant over the short term, but as the period between assessments increases the results may diverge more. At Integris, we recommend re-taking the DiSC assessment every two years to ensure it captures your current style. Test-retest studies demonstrate the assessment’s ability to yield the same measurements over a period of time. This means that, on average, you should expect no more than small changes when the DiSC assessment is taken with little time in between. While very short intervals between assessments may not yield the exact same results, these differences are often influenced by other external factors and not a change in your core DiSC style. #2 − What factors might influence how I respond to the DiSC assessment? It is almost impossible to get exactly the same results on any sophisticated psychological test, even if the individual does not change. Test results are influenced by a variety of extraneous factors that are unrelated to the characteristics that the test intends to measure. Those include the environment, stress, and time. For instance, someone who is tired while taking one assessment may answer differently than when he or she is well rested. Another person may respond to an assessment differently depending on his or her mood, while your responses might differ if you are interrupted or distracted while completing the assessment. #3 − Do I have a different style at home than at work? First, it’s important to remember that DiSC is a measure of style. It is about your style preferences. Second, everyone is a blend of all four styles. In fact, it is probably most useful to think of the DiSC circle in continuous terms, not as four separate quadrants, with each of the four styles blending into their neighboring styles much the same way that colors blend into one another on the color wheel. So, whether at home or at work you don’t really change the essence of who you are, but you may change how you respond to others in each different environment. That’s to be expected. You are likely to float between a few dominant styles based on each unique circumstance. That doesn’t mean you are a different person, it just means you know you need to flex your behaviors to succeed in a variety of situations. #4 − Why does my feedback seem to contradict what I know about my DiSC style? Every individual is just that: individual. We are all unique and multidimensional. Therefore, there may be times when your Profile report and narrative feedback don’t seem completely consistent with characteristics typical of DiSC style. For instance, we know that two people with the D style are not identical. This is because the D style has many correlated but unique qualities such as forcefulness, directness, and tough-mindedness. There are times when an individual may demonstrate only two out of three of these characteristics and still be classified as a D style. Unexpected behaviors or priorities outside of the typical characteristics of a DiSC style help reflect the depth of a person’s individual personality. #5 − Is it true that my DiSC style is my more “natural” style? There really is nothing that suggests that we are limited to just two styles—one is more natural, the other being more adaptive. Every individual is a blend of all four equally valuable styles on the DiSC model, even though we do tend to be more inclined toward one or two—say a Di style or a CS style. Being adaptable when interacting with others is something every style can do. #6 − You’ve heard the word “stretch” tossed around and want to know what that means? Remembering to think of the DiSC model as a continuous circle with your style as your home base or comfort zone will help you understand the idea of “stretch.” Say that you are a C style who is very comfortable working alone on analytical projects that require accuracy. At times, however, you also are required to mingle with strangers at a professional function. In this case, you are being asked to stretch across the DiSC circle toward the i style. Now, depending upon the location of your dot on the DiSC circle you might find making small talk and socializing with people you don’t know either unpleasant but manageable (if your dot is closer to the center) or incredibly stressful (if your dot is at the outer edge of the circle). The further your dot is away from the center, the more energy it may take to travel out of your comfort zone—the more you will need to stretch—in order to adopt certain aspects of another style when required. #7 − How often do people have an extra priority beyond the three associated with their dominant style? As you’ll recall, everyone has three basic priorities for their style. However, some people have one or even two more priorities—ones that aren’t normally related to their style. For example, an influence style who prioritizes accuracy will show a shaded area into that priority for the Conscientiousness style. About one-third of people will test to have an extra priority or two. #8 − Is one DiSC style more prevalent in the United States population? Not to any real degree. The standardization of the eight scales ensured that the assignment of DiSC styles was roughly equal across the twelve styles. The Everything DiSC assessment has been translated into other languages where local norm groups are used to establish the optimal items and norms for each scale. #9 − Do certain professions tend to be one style or another? The distribution of successful people in each dimension is pretty evenly distributed. That said, some people are likely drawn to certain professions. For example, people in sales tend to show up in the i quadrant, but they are also found in the other three quadrants. 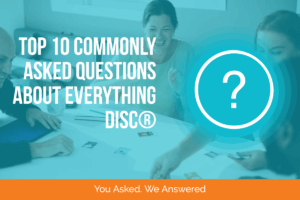 #10 − Can DiSC be used as a hiring tool? DiSC assessments are powerful tools to generate self-awareness and understanding, and initiate dialog and improved communication. They are not tools for diagnosis. Nor are they pre-hire tools that measure skills and abilities for a specific role in your organization. DiSC does not assess competencies, aptitudes, EI, or any skills sets needed to be successful in a job or career. In fact, while some styles may be drawn to certain career paths, there is no evidence that style is any predictor of success. However, many organizations do use Everything DiSC Workplace to help hiring managers gain a better understanding of a new employee’s style preferences and ideal work environments. DiSC can help ensure that every hire has the best chance of being as successful as possible.